"What a silly thing Love is. It is not half as useful as Logic, for it does not prove anything, & it is always telling one of things that are not going to happen, & making one believe things that are not true. 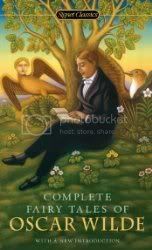 In fact, it is quite impractical..." from "The Nightingale and the Rose"
I'll admit up front that I've never read anything by Oscar Wilde before now, and I think that I'm sorry that I've waited this long. I thoroughly enjoyed his fairy tales, and even found myself underlining multiple passages in the book for future reference. I felt that his insight into life and love and all the joy and troubles that come with both was quite remarkable and still very relevant for our time, even though these stories were written over 100 years ago. I'm sure that if I were more versed in fairy tales and folklore as a whole I might see more relations between his stories and those that came before, but taking these for what they are I enjoyed them immensely. The particular volume that I have contains both of Wilde's collections, The Happy Prince and Other Tales and A House of Pomegranates, in one volume, and I while I enjoyed all the stories, I found that I did enjoy the stories that were from The Happy Prince and Other Tales slightly more. The stories contained in The Happy Prince and Other Tales are "The Happy Prince", "The Nightingale and the Rose" (my favorite), "The Selfish Giant", "The Devoted Friend" (probably my next favorite), and "The Remarkable Rocket". A House of Pomegranates contains "The Young King", "The Birthday of the Infanta", "The Fisherman and His Soul" (a unique reworking of "The Little Mermaid"), and "The Star-Child" (another unique reworking of "Beauty and the Beast"). The stories can easily be enjoyed just as much by adults as by children, and I think that adults as a whole may actually get more out the stories than children. The tales deal broadly with love and individualism and being true to your self even when others may look down on you. The views of love are both in and out of favor of it, and my favorite passage from the book deals with Love and how it can lead one astray: "What a silly thing Love is. It is not half as useful as Logic, for it does not prove anything, and it is always telling one of things that are not going to happen, and making one believe things that are not true. In fact, it is quite impractical..." Like I said, the insights that Wilde has on love and life are quite remarkable and I found them very relevant for my life right now. I would highly recommend this book to anyone.